Postsecondary attainment is increasingly necessary to move out of poverty and homelessness and live a healthy, productive life. 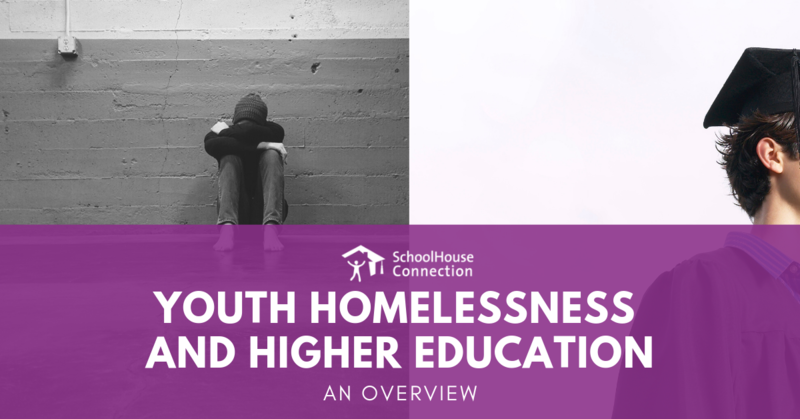 Yet youth experiencing homelessness face barriers in transitioning from secondary to postsecondary education, as well as barriers to financial aid, college retention, and college completion. This fact sheet summarizes existing data and information on youth homelessness and higher education. Many Youth Experiencing Homelessness Aspire to Jobs that Require Postsecondary Education. Despite facing many challenges resulting from deep poverty, abandonment, and abuse and neglect, many youth who experience homelessness wish to pursue careers that require some form of postsecondary education. A California Homeless Youth Project study found that more than 90 percent of youth interviewed specified a career goal that required education beyond high school. Yet only 16 percent said they believed they would be able to attend or graduate college within the next five years. Youth Experiencing Homelessness Face Barriers to Pursuing College. A 2016 Government Accountability Office (GAO) study found that homeless youth experience challenges that make it harder for them to pursue college, such as weak academic foundations, limited family support, and lack of awareness of available financial resources. In response to these barriers, the Every Student Succeeds Act contains several provisions designed to increase college readiness and access, including requirements for counselors to prepare and advise homeless students for college, and requirements for school district liaisons to inform unaccompanied homeless youth of their status as independent students for federal student aid and help them obtain documentation required to qualify for such aid. A Significant Number of College Students Experience Homelessness. According to a national study by Chapin Hall at the University of Chicago, 4.2 million youth and young adults experienced homelessness on their own during a 12-month period. This number includes 3.5 million young adults between the ages of 18-25. Chapin Hall’s study also found 29% of young adults who experienced homelessness were enrolled in college or another educational program at the time that they experienced homelessness. A 2018 survey of 66 colleges and universities in 20 states and Washington, D.C., found that 12% of community college students and 9% of university students experienced homelessness over the last year. A 2018 study found that 19% of California State University students reported experiencing homelessness one or more times in the last 12 months. Youth Experiencing Homelessness Encounter Challenges with Financial Aid. Unaccompanied homeless youth are not living with, or supported by, a parent or guardian and cannot obtain parental income information. Therefore, under the Higher Education Act, they are considered independent students and do not need to provide a parent’s signature or information about parents’ income on the FAFSA. A 2016 GAO report found that burdensome financial aid program rules (including the requirement to document status each year) can make it more difficult for unaccompanied homeless youth to obtain federal financial assistance for college. The number of Free Application for Federal Student Aid (FAFSA) applicants determined to be unaccompanied homeless youth increased by 10% from 2013 to 2017, which may indicate some progress in removing barriers to FAFSA completion. The number of homeless youth determinations made by financial aid administrators continues to lag well behind determinations made by other authorized entities. In addition, homeless service providers’ determinations have declined significantly. Many Students Who Experience Homelessness are Also Food Insecure. Food insecurity is the lack of consistent access to enough food for an active, healthy life. A 2018 study found that 8% of community college students experienced both food insecurity and homelessness, and that 6% of four-year university students experienced both food insecurity and homelessness. Homelessness Impacts the Academic Progress of College Students. According to California State University’s 2018 study, many students experiencing homelessness, food insecurity, or both had lower GPAs and stronger academic concerns than students who reported being housed and/or food secure. Institutions of Higher Education are Responding in a Variety of Ways. Schools like North Carolina State University and the California State University system are creating basic needs assessment surveys to learn more about their student population. Institutions have included questions about homelessness in their applications and have used other strategies, such as partnering with the financial aid office, to identify homeless college students. SchoolHouse Connection has created a series of tip sheets that summarize best practices from across the nation on the following topics: Transitioning from High School to College; Identifying Homeless College Students; Housing On and Off Campus; Accessing Financial Aid; Creating and Sustaining Campus-Based Programs; and Parenting Students. Policy Change is Underway in State Legislatures and the U.S. Congress. Some state legislatures have enacted laws to support college students experiencing homelessness, addressing issues ranging from housing to tuition and fee waivers. In 2019, additional states will pursue higher education and homelessness legislation. The U.S. Congress is contemplating changes to the Higher Education Act, including those that will affect youth experiencing homelessness.